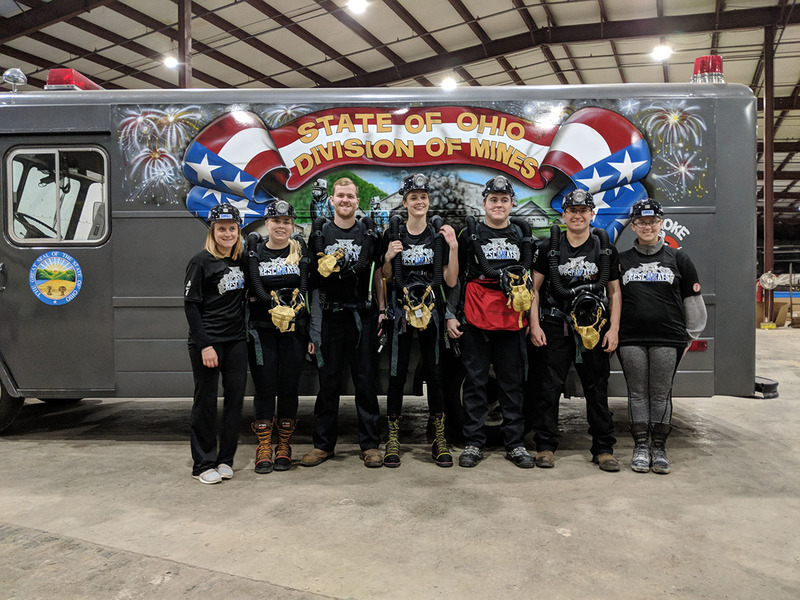 The RescUKats, the University of Kentucky Mine Rescue Team, won the Spring 2018 Eastern Collegiate Mine Rescue Competition. The competition was hosted by the Ohio State Division of Mines at their training grounds in Cadiz, Ohio April 6-7. Competitive mine rescue teams from Southern Illinois University, West Virginia University, Penn State University and the University of Kentucky participated. The competition had three events, a written exam, a bench competition and a mine rescue problem. The UK team placed first in the Mine Rescue field event with a perfect score. In addition, an individual prize was given to Brian Watkins for first place in his individual event of benching (testing) the team's apparatus' with zero errors. The RescUKats credit their success to their trainer, Danny Knott of the Kentucky Coal Academy; their faculty advisor, Steven Schafrik; and, most importantly, their sponsors: Alliance Coal, Blackhawk Mining, the Kentucky Coal Association, Friends of Coal, the Western Kentucky Mining Institute and the Central Appalachian Regional Education and Research Center.